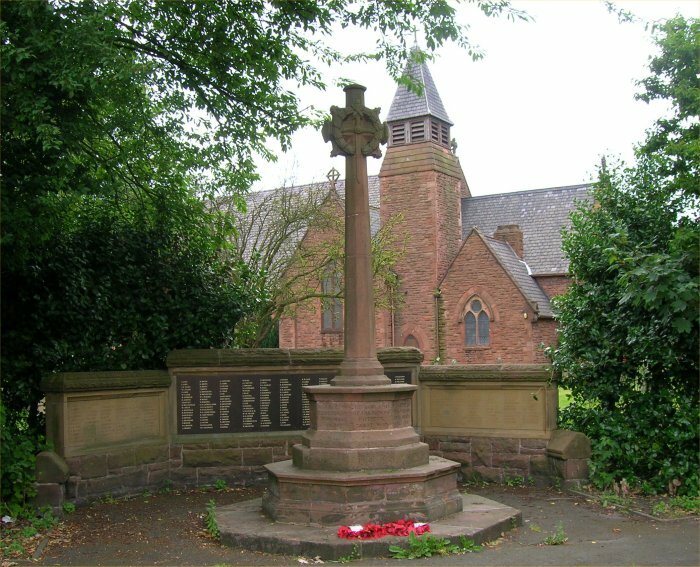 Located in Church Street in the gardens in front of Christchurch, the original parish church of Ellesmere Port. Located in Church Street in the gardens in front of Christchurch, this is a Celtic cross backed by a low sandstone wall with three granite tablets built in. 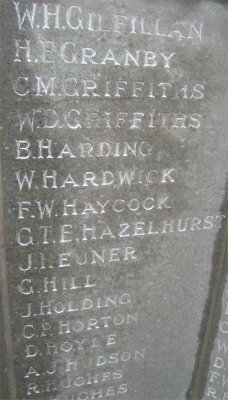 The centre tablet is inscribed with First World War names, and the side panels with Second World War names. The cross is embellished at the cross junction with a sword and a laurel wreath. It took the people of Ellesmere Port seven years to finally organise the erection of a suitably fitting memorial to commemorate the men of the town who had lost their lives in the First World War. 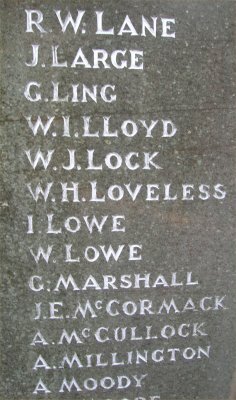 After the local Council had bickered and quibbled over where to site the memorial - with some questioning whether it was needed at all - the local parish church formed a committee to get on with the programme of canvassing local people, fund raising, and design, with an intent to have it ready for Armistice Day 1925 - then only around 11 weeks away. 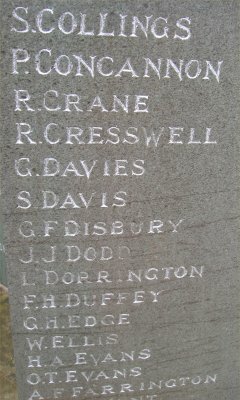 Their target was met and the unveiling ceremony took place as promised on Saturday 7 November 1925. Its use as a cenotaph was replaced by the memorial in the Civic square in 2005(see below). 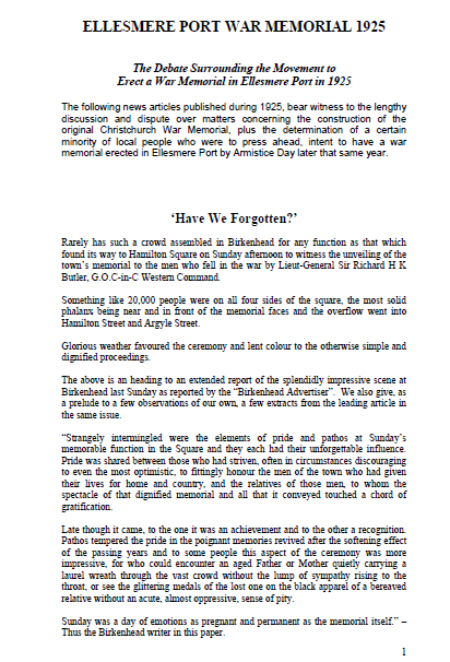 Researched and transcribed by Alan Gregson of Stoak, this collection of news articles published during 1925, bear witness to the lengthy discussion and dispute over matters concerning the construction of the original Christchurch War Memorial, plus the determination of a certain minority of local people who were to press ahead, intent to have a war memorial erected in Ellesmere Port by Armistice Day later that same year. However, by November 2005 veterans from Ellesmere Port's Royal British Legion had all spoken out in praise of the improvement work nearing completion in Ellesmere Port's Civic Square. Work to totally revamp the square, with new paving, trees, new seating and a fountain has been ongoing since May. 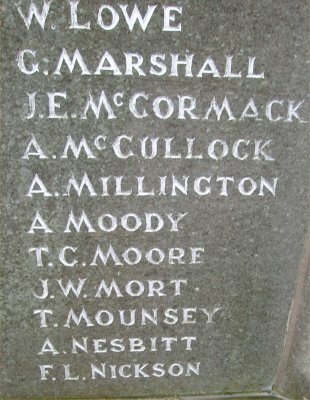 The square's war memorial, which has been cleaned and re-sited as part of the project, was to be used on Remembrance Day during the two-minute silence at 11am. 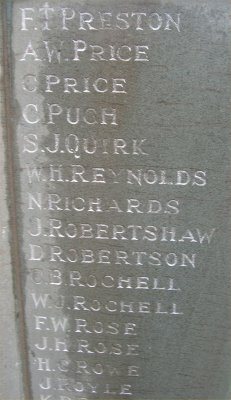 Then on Sunday 13 November (Remembrance Sunday) veterans were to gather at the war memorial at 10.20am. Veterans voiced their support for the Civic Square improvements after visit to the site. Ted Roach, Acting Chairman of the Royal British Legion and Les Stuffin from the Royal British Legion, along with Captain Phil Thompson from the Territorial Army joined Town Centre Manager Lorraine Taylor and Site Manager for the construction company Birse CL Greg Baverstock for the visit. Ted Roach from the Royal British Legion said: "We had a really positive site meeting with the council to look at the new Civic Square. I could not fail to be impressed by the extent of the improvements that are now nearing completion. While it is common knowledge that we initially took a different view to the council, I am pleased to say that we are all working amicably together to ensure that the remembrance ceremonies are a success, taking full advantage of the excellent space and facilities within the square." 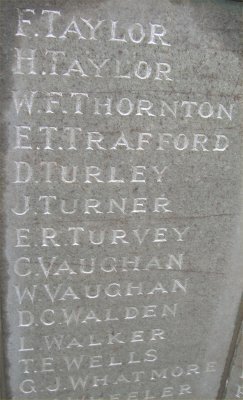 Ted had a more personal interest in the memorial as his grandson Marc Taylor, who was killed in action in Iraq last year (and a former pupil of Whitby High School), was the last soldier to have his name added to the memorial. Leader of Ellesmere Port and Neston Borough Council Cllr Reg Chrimes said: "The new Civic Square is now taking shape and will be officially opened at the beginning of December. 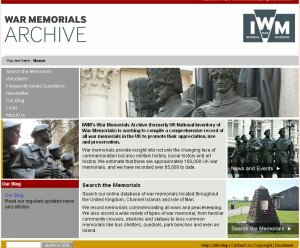 We're delighted that the veterans share our view that this is a project to be proud of and we hope the rest of the community will agree that the improvements to the square and the re-siting of the War Memorial have succeeded in creating an attractive, tranquil space in Ellesmere Port town centre for everyone to enjoy." The Civic Square memorial was originally unveiled in in November 1978, by the Rev. 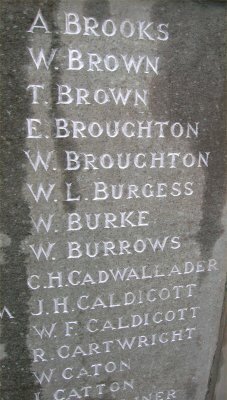 John Bowers, the Royal British Legion Chaplain, having been funded by the British Legion Ellesmere Port and Public Subscription. 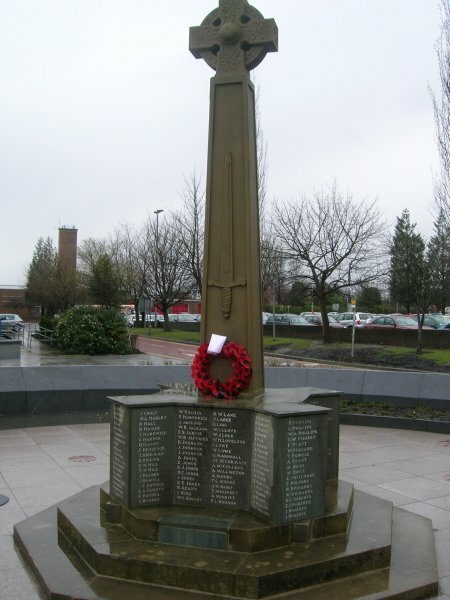 The new memorial was a dressed celtic cross on a cuciform base with an inlaid sword on the front face. 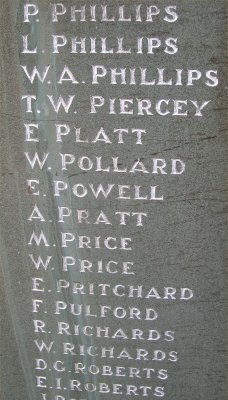 The memorial is dedicated to local men who were lost in the conflicts of WWI, WWII, Falklands and Iraq. 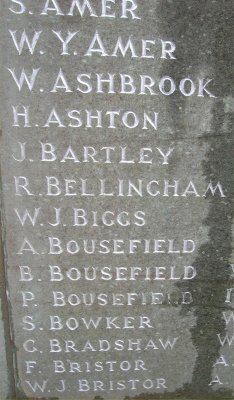 The names of the men are inscribed along with Binyon's line 'We will remember them'.